﻿For women marching through middle age, belly fat seems a fact of life. However, recent studies on belly fat have revealed that belly fat may no longer be common only among women in their 50's. Certain factors like stress and a sedentary lifestyle have resulted in a rise in obesity and a growing concern about weight loss. In the face of all the expensive weight loss programs, it is still possible to lose weight without having to resort to all the fad diets, supplements and drastic measures such as liposuction that may do more harm than good in the long run. Fortunately, abdominal obesity can be easily lost through proper diet and exercise. In 2004, a study published in The New England Journal of Medicine revealed that liposuction removal of subcutaneous fat on 15 obese subjects had no effect on the levels of their blood sugar, blood pressure, response to insulin or cholesterol. However, it was discovered that weight loss through exercise and diet triggered positive health changes. Moreover, losing fat by starving yourself may not be the best idea either. Starvation, ironically, induces the body to store fat because it slows down the metabolism. If you have been reading up on weight loss, you would have stumbled upon the idea of a low calorie diet. Low-calorie diets are effective in losing abdominal fat; however, once the hunger pangs become a regular occurrence, the diet becomes difficult to maintain and at the first possible opportunity, binging can occur. Furthermore, low calorie diets are not without inconvenient side effects such as mood swings, poor memory and hair loss to name a few. The symptoms worsen over time and can develop into illnesses or diseases, totally defeating the purpose of why it was necessary to lose weight for health in the first place. 1. Apples - There is wisdom to the saying, an apple a day keeps the doctor away. In a Brazilian weight study, subjects who ate three apples a day while dieting lost more weight than those who didn't. This fruit contains pectin, a compound that is known to inhibit colon cancer. Apples are packed with nutrients and are a rich source of vitamin C, beta-carotene, dietary fiber, phytosterol, flavonoids, antioxidants, vitamins and minerals. 2. Watermelons - In a study conducted by the University of Kentucky, watermelon was found to have a significant effect on artery plaque deposition because it altered blood lipids and lowered the risk of developing belly fat. The researchers in the study observed that animal subjects in the experiment who had diet-induced high cholesterol were given a supplement of watermelon juice while another group was given a typical diet with water. Eight weeks later, the animals given watermelon juice had lower body weight than those who were just given water. It appeared that there was no decrease in muscle mass and the weight loss was due to abdominal fat loss. 3. Tomatoes - A large tomato contains only around 33 calories. Moreover, a recent study identified a compound extracted specifically from the fruit called 9-oxo-octadecadienoic (9-oxo-ODA) which was shown to influence the amount of blood lipids in circulation. According to Dr. Teruo Kawada, the study leader, "finding a compound which helps the prevention of obesity-related chronic diseases in food stuff is a great advantage to tackling these diseases, and tomato allows people to manage the onset of dyslipedemia through their daily diet." According to Wikipedia, Dyslipedemia is a condition where there is too much lipid in the blood. This normally caused by diet and lifestyle. 4. Bananas - This is a fruit you can enjoy as a nutritious snack without ever worrying about gaining weight. Like apples, it contains a fiber called pectin that is known to inhibit colon cancer. It also contains vitamin A, C, E, B6 as well as potassium, calcium and magnesium. Bananas, depending upon the size, contain calories between 75 calories to 135 calories only. 5. Seafood - Seafood, when included in the diet, could result in a slimmer waist and better health. For those enjoying excellent health and ideal body weight, having seafood on a regular basis may even prevent possible future poor health and weight gain. Studies have shown that seafood has been found to contain monounsaturated fat (MUFA). 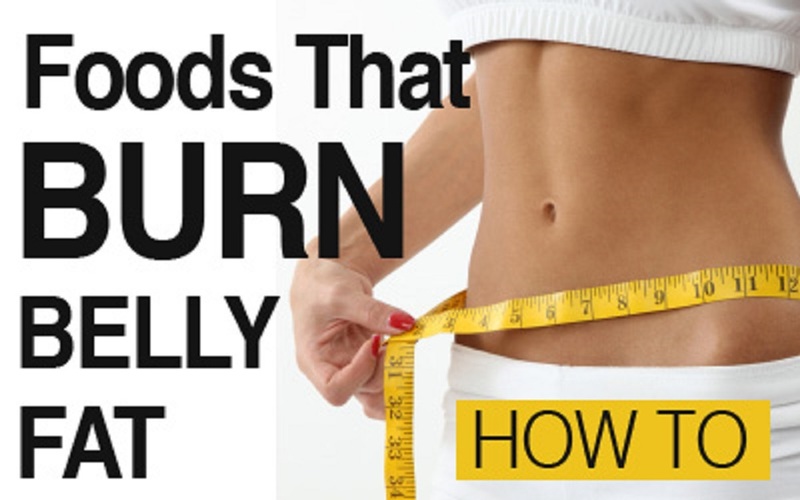 Studies have also shown that having a regular diet with foods containing MUFA can prevent belly fat. 6. Lamb - Lamb contains vitamin B, protein, zinc and trytophan. This is certainly a better option to processed or canned meat, and is a healthy source of protein. Lamb contains conjugated linoleic acid. According to Dr. James Howenstine, author of "A Physician's Guide to Natural Health Products That Work," low levels of conjugated linoleic acid in the body can lead to obesity since dietary fat cannot be used as energy and is moved into cells resulting in fat storage. Editor's note: I cannot condone eating lamb due to humanitarian reasons. Lambs are mammals, and it would be far less damaging to living beings if you chose to eat a simpler lifeform instead, such as fish. 7. Tart cherries - In a study conducted by the University of Michigan, it was found that a diet containing tart cherries may help lower symptoms of heart disease and metabolic syndrome. Metabolic syndrome is a term used to refer to a group of symptoms which increase the risk of a host of heart diseases, diabetes and belly fat. In the study, the animal subjects had reduced cholesterol levels and a fat content of only 54 percent compared to the non-cherry fed group of 63 percent belly fat. Tart cherries have also been identified to have antioxidant properties. 8. Celery - Celery is a negative calorie food containing only eight calories. It is high in vitamin C, calcium and is best enjoyed raw. Enjoying fresh celery juice before a meal can even help you lose weight. It contains apigenin, an active compound that slashes the risk of ovarian cancer. 9. Avocados - This fruit has anti-bacterial and anti-fungal properties. It contains the amino acid lecithin - which helps in preventing liver overload - and aids the memory and helps balance weight. In one study, it was discovered that people who ate a considerable amount of avocados showed clear improvement in health. It balances cholesterol levels and prevents heart attacks and strokes. 10. Kelp noodles - According to NaturalNews.com, kelp noodles are a good alternative for those who love traditional noodles. They are made from seaweed and contain only six calories. They are raw and mineral rich and can be used like any regular noodles. It's time to reconsider the low-calorie dieting theory and recognize that only natural foods can properly nourish the body and help it rebuild itself. Food can actually help us in attaining good health and proper weight management. When coupled with exercise, it can help us achieve sustainable weight loss, avoid obesity, prevent a host of other chronic diseases and increase health benefits that directly improve our quality of life.